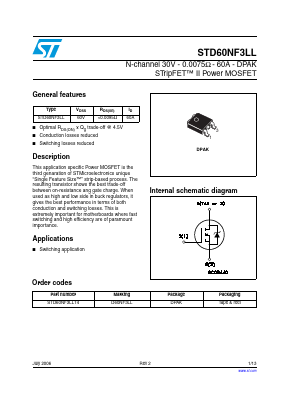 This application specific Power MOSFET is the third genaration of STMicroelectronics unique “Single Feature Size™” strip-based process. The resulting transistor shows the best trade-off between on-resistance ang gate charge. When used as high and low side in buck regulators, it gives the best performance in terms of both conduction and switching losses. This is extremely important for motherboards where fast switching and high efficiency are of paramount importance.